Happy July, I hope you've been enjoying the summer sunshine - I certainly have! Beauty-wise, summer entails everything from cream blusher, high-SPF coverage and that all-important glowing tan. I'm lucky enough to say I'm going back to Italy in the next few days and these are the products that have got me feeling ready for summer. Starting off with the beauty innovation of the summer, the St Tropez in-shower gradual tan, I'm happy to say after three weeks of use I have a glowing report. Yes it does take around three uses to see a difference but it's totally worth the wait. The only downside is the three minutes you have to stand around with the shower off but it's no different than waiting for a hair mask or Aussie 3 minute miracle. Be sure to apply it evenly though, I've noticed a few patches on my foot which everyone finds simply hilarious. Moving onto the Benefit mini skincare pots, this set was a kind birthday gift from my uni flatmates which I can't wait to take on holiday with me - the sizes are perfect! I've tried them all out due to curiosity and I've been very impressed. It's unlikely I'll be buying them in full size (due to price and my undying love affair with Clarins) but the Total Moisture moisturizer is fantastic for any dry patches and the foaming cleanser is nice and gentle so great for even sensitive skin. 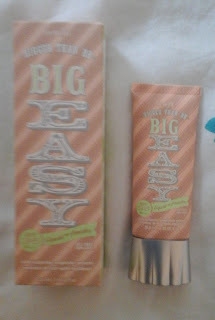 The Benefit Big Easy is a gorgeous 'Better than BB' tinted moisturizer with 35+SPF. As you'd expect, the coverage is light and the formula is aimed at an oilier skintype which is perfect for me. I've been trialling this on my 'better skin days' and so far I've been really enjoying it as it gives a great combination of a healthy glow and shine protection. As it's a liquid to powder finish, it'll stay put even in the heat and that's a big thumbs up from me. To pair with 'Big Easy', I also purchased the famous Benefit 'Boi-ing' high coverage concealer which I now can't do without. It's a little pot rather than a doe-foot applicator - if you compare it with the Collection Lasting Perfection Concealer - but don't let that put you off. Make sure you get one of the Benefit ladies to match you with the right colour and you'll avoid looking ghost-like or orange. 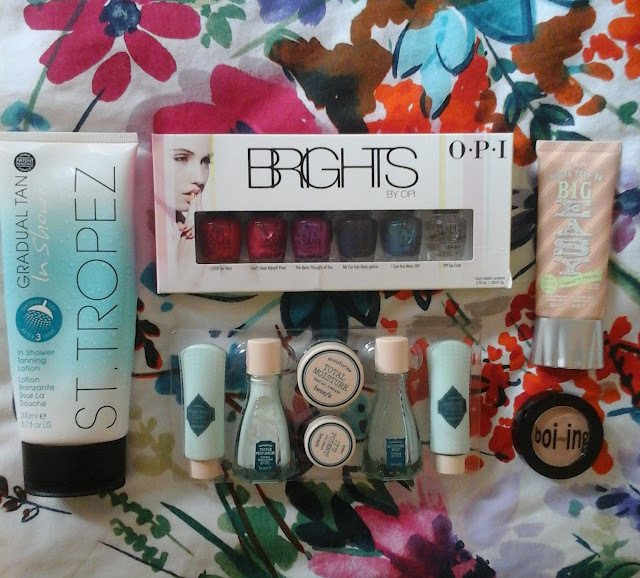 Finally the OPI 'Brights' mini lacquer collection was another birthday present which has got me feeling all summery. It includes I STOP for Red - a gorgeous apple-red, Can't Hear Myself Pink - a shimmery rose-pink, The Berry Thought of You - a berry fuschia, My Car has Navy-gation - an inky blue, I See You Wear OPI - a shimmery mermaid aquamarine, and a mini RapiDry top coat. It's been fun to play around with the colours and they've definitely earned their place in my suitcase! Have you bought any new holiday beauty products? Is there anything I need to add to my collection?